ASTER is a program (and only a program! ), which allows several users to work with one computer independently as if each of them had their own PC. ASTER is a shared computer access software solution and does not use thin clients and terminal stations, i.e. ASTER is analog of such popular programs, as MS MultiPoint, SoftXpand, Betwin, Userful etc. The program ensures stable operation with a standard set of office, accounting, and training software, graphic applications, and even net games. 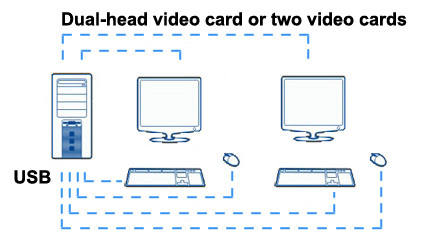 To set up each workplace, you just need to connect another monitor, keyboard and an extra mouse to the available shared computer. After the installation and start-up process, ASTER will present a separate desktop on each monitor (dual screen) and users will be able to work with the computer as independently as if each of them had their own PC. ​ASTER is a program (and only a program! ), which allows several users to work with one computer independently as if each of them had their own PC. ASTER is a shared computer access software solution and does not use thin clients and terminal stations, i.e. ASTER is analog of such popular programs, as MS MultiPoint, SoftXpand, Betwin, Userful etc. The program ensures stable operation with a standard set of office, accounting, and training software, graphic applications, and even net games. 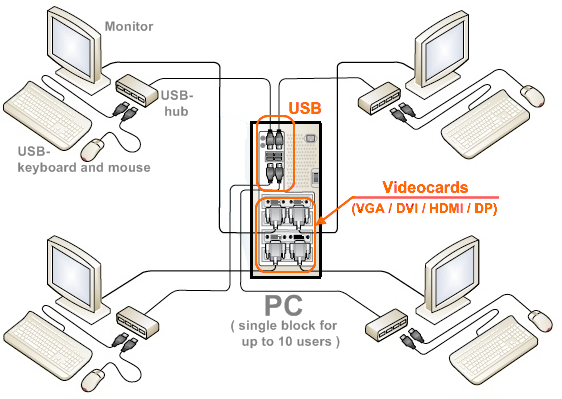 To set up each workplace, you just need to connect another monitor, keyboard and an extra mouse to the available shared computer. After the installation and start-up process, ASTER will present a separate desktop on each monitor (dual screen) and users will be able to work with the computer as independently as if each of them had their own PC.